A Canadian architect has been selected for the second phase of work at a world-renowned gallery in Cornwall. Tate St Ives and Cornwall County Council have announced that Jamie Fobert was selected after interest from 50 architectural practices. Mr Fobert studied in Toronto before coming to London in 1987. Other projects include designs for Tate Modern and Tate Britain. 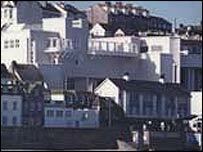 More than 2m people have visited the Tate St Ives since it opened in 1993. But after 12 years the building needs extra work to meet visitors' needs. In peak periods there are often three times as many visitors as originally estimated. The Tate St Ives Phase Two Development will feature a new building on part of the Barnoon Car Park above the existing gallery. It will provide more space for temporary exhibitions, an education area, reception, offices and storage. The new and existing buildings will be linked to allow visitors to move from one to another.